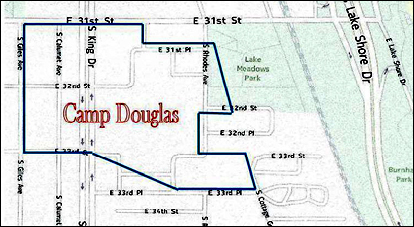 Chicago genealogist Tony Burroughs posted on Facebook this past week that he had signed a Change.org petition to urge that Camp Douglas be placed on the National Register of Historic Places. Boy oh boy is The Legal Genealogist ever in on that one. • Property associated with events, activities, or developments that were important in the past. Camp Douglas qualifies on both counts. So I urge you to join Tony and me in supporting the Change.org petition urging that Camp Douglas be placed on the National Register of Historic Places. If you’d like more information, I urge you to check out the website of the Camp Douglas Restoration Foundation. And, in doing so, I will tell you: for me, this is personal. The story, for my family, is the story of one who was just a boy when he first went off to war. Just 18 years old when he enlisted as a private in Company G of the 25th Regiment of North Carolina State Troops. Sidney was the youngest, and you know it must have gladdened his mother’s heart when that youngest boy was sent home from the war that March of 1862. She had to know she couldn’t protect all of her sons with war raging in the land… but she had to have thought, at that moment, that perhaps she could keep that one home. And he was off to war once more. It must have been a source of some comment within Company B, where Sidney was sergeant over his much older brother Charles. Charles was 16 years older than his baby brother; he was married, and had eight children in his household on the 1860 census.16 Sidney wasn’t much older than Charles’ oldest son. But it must also have been a comfort for Sidney to have his older brother near. Maybe he even started believing he would make it home. All told, David and Dorothy (Baker) Davenport sent six sons into the Confederate Army (Charles, Abner, Josiah, Robert, John and Sidney). Half of them never made it home. When and where Abner died and where he was buried, that remains to be determined. But Sidney and Charles lie together today with 194 others from the 62nd North Carolina — and with thousands of other Confederates who died at Camp Douglas and whose bodies were later moved to a single mass grave. A pillar stands on Confederate Mound in Oak Woods Cemetery above the grave and the names of those known to have died are inscribed there. Davenport, C.E., Co. B, 62nd N.C.
Rest in peace, cousins. And let us all remember them… and the place where they died. My connection to Camp Douglas is that my second great grandfather, Samuel Sewall Greeley, a Chicago civil engineer, submitted a design for a water and sewer system for the camp. See the blog post here. I also have a connection to Camp Douglas. My great grandfather, John Thomas Barker, and his brother, William, both served in the 29th Georgia Infantry and were taken prisoners at the Battle of Franklin in December 1864. They were both sent to Camp Douglas. When they were released, they walked home to Georgia. My grandfather had promised a dying soldier – a Mr. Gray – to take the news of his death to his fiancée – Miss Linia Blake. Not surprising, it wasn’t too long before Miss Blake became Mrs. Barker. Thanks for passing along the Camp Douglas info. I also want to see it preserved. OH. MY. GOD. The near-exact same story occurs in my son’s paternal line. That’s such a sad story about your Davenport cousins, Judy. I recently read some notes written by some Civil War soldiers; and if I remember correctly, one man wrote home that eating rat meat tasted like eating squirrel. I think I also read that some wrote about picking off lice and cooking them. We can’t begin to understand what these brave young men endured. By all accounts, diarrhea was a big killer during the Civil War; and it’s difficult to imagine anything more awful than the terrible living conditions of a camp full men suffering with the vomiting/diarrhea that killed your cousin. May they all rest in peace. Conditions in all the camps were truly appalling… north and south. Can’t imagine living (and dying) like that. Camp Douglas is also where Union regiments that were surrendered to the Confederates at Harpers Ferry were taken including my gggrandfather, Ziba Shippee. I have Ziba’s compiled military record and his entire pension record ($160 from NARA but well worth the expense!). The conditions the Union soldiers were subjected to were as bad as what the Confederates suffered, believe it or not. He and many of the Union soldier’s were housed in old stables at the Illinois State Fair grounds near Camp Douglas because the Camp itself was so full. From what I can tell from Ziba’s records, because of the cold, rainy weather they suffered through in the stables, he became miserably ill and was taken to a hospital. The rest of his life, not only did he suffer from his wounds received at Harper’s Ferry but from the illness (“fever”) he suffered. He was not only physically disable but he was left nearly deaf and blind and suffered from intestinal issues the rest of his life. What the men endured is beyond comprehension and amazes me that any of them lived. It is important that this Camp be made a historical landmark to honor the men who suffered here. I also recommend reading “To Die in Chicago” if one can find a copy. I was able to get a used copy through Amazon a few years ago and it tells the heartbreaking stories of the men. My great great grandfather, AAron Spencer Hobbs, was at Camp Douglas when he died. He is buried in the single mass grave in City Cemetary. Aaron Spencer Hobbs was my great great great great grandfather. What about the third Davenport named on that stone, W.H. From Tennessee? Any chance he is somehow related to the other two? It’s certainly possible — but I don’t have any information about him. He’s not — thank heavens!! — the William who was the brother of Sidney and Charles. I have a great great Uncle who was an Irish immigrant who died at Camp Douglas. He wasn’t even a citizen! He was at Cumberland Gap when his unit was taken as POW’s. He was buried in the mass grave in City Cemetery also. Such a sad story. The whole Camp Douglas story is a sad story. My apologies if I missed that it had been turned down through those channels or something forcing the work-around. Definitely a worthwhile place to have on the National Historic Registry. The website of the Camp Douglas Restoration Foundation indicates it is in the process of preparing a formal application but is using this process to help it gather public support. This isn’t the usual kind of property that gets included, so it’s looking to broaden awareness and a base of support. A very fine article. This story deserves to be more widely read, and I have shared it to several Facebook pages and groups, including Camp Douglas Memorial #516, the Chicago Camp of the Sons of Confederate Veterans. Bravo!